Preheat oven to 375 degrees F. Spray a loaf pan (mine is 10x5x3) with non-stick spray. Heat a skillet oven medium heat and add chopped bacon. Stir and cook until crispy and fat is rendered, then remove with a slotted spoon and drain on a paper towel. Turn off heat but don’t discard bacon fat. In a large bowl, mix together cornmeal, flour, sugar, baking powder and salt. In a small bowl, whisk together milk and eggs. 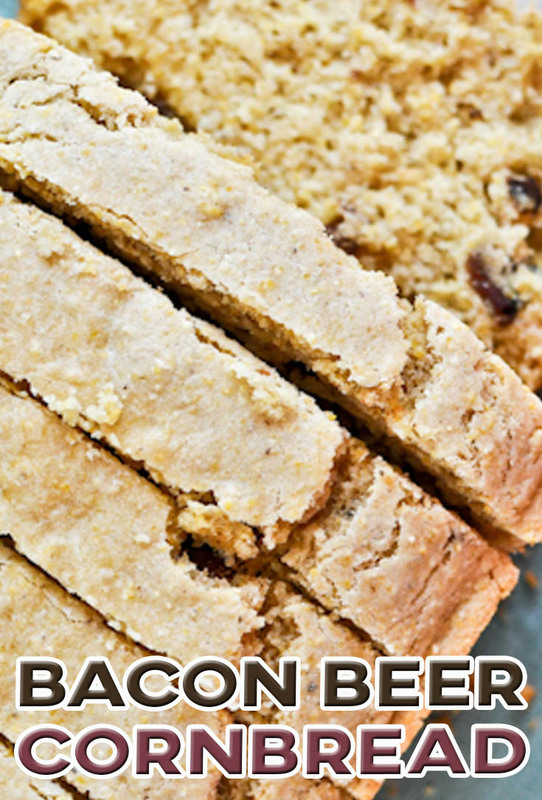 Add milk and eggs to dry ingredients, mixing until combined, then add in sour cream and beer. Mix and add in butter and leftover bacon fat, mixing until batter is somewhat smooth but just combined. Fold in bacon. Pour batter in loaf pan, then place pan on a baking sheet and bake for 30-35 minutes, or until top is golden. Let cool for 20-30 minutes, then remove from the pan and slice.